Oval chainrings have been around for many years in various forms and configurations. The concept is simple enough. Oval chainrings aim to minimize the “dead spot” in the pedal stroke and lengthen the power phase. The result, according to proponents of oval rings, is a more efficient and powerful pedal stroke. However, there is a long running debate in the cycling community regarding power meters and oval chainrings. The question is, to what extent, if any, do oval chainrings impact power meter accuracy. So if you’re a fan of oval chainrings and you train with power, this article is for you. With a standard round chairing, when your feet come across 6 and 12 o’clock during your pedal stroke, your power drops significantly. Oval chainrings, also called non-round or elliptical rings, are shaped in a manner as to minimize this dead spot. The non-round shape means your pedal stroke passes through this dead spot more quickly. Moreover, the non-round shape emphasizes 3 and 9 o’clock, your power position, allowing you to produce maximum power there. By allowing the legs to do work where they are at their strongest, and less where they are at their weakest, the theory is you will have a more efficient, powerful pedal stoke. The majority of oval rings have a relative difference of about 10% from the strong spot to the weak spot. For example, a 53-tooth ring feels like a 58-tooth in the power phase, and a 48-tooth in the dead spot. While not the subject of this article, I felt compelled to at least touch on this (somewhat hotly debated) topic. Researchers have examined both the physiological and performance differences between oval and round rings on several occasions. Some reports conclude that oval rings are indeed effective. Furthermore, numerous professional riders including elite cyclists such as Bradly Wiggins and Chris Froome have used oval rings. (Chris Froome still does and swears by them.) Surely they know something…right? On the contrary, you can find reports and studies that don’t show any real performance gains. Likewise, it’s easy to find someone who has used oval rings and has found their way back to round rings. It’s probably fair to say, if they help, the gains are marginal. But this is a sport that is all about marginal gains…so that’s not a put-down. Ultimately, you need to give them a try and decide for yourself. Remember, it’s not always a clear-cut ‘they work or they don’t’ situation. What works for one, might not work for another and vice-versa. In addition, it’s all about how you feel and rider preference. If oval rings feel better and more natural to you, use them. If not, don’t. Lastly, it has been theorized that oval chainrings may be more helpful to the amateur cyclist. Why? Because professional cyclists already have very efficient pedal strokes with minimal dead-spots. 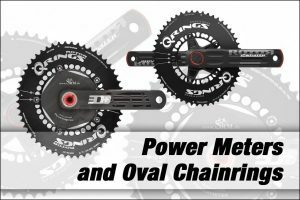 Power Meters and Oval Chainrings: Are they Compatible? Here’s the concern: most power meters make the assumption that your pedaling velocity is constant. 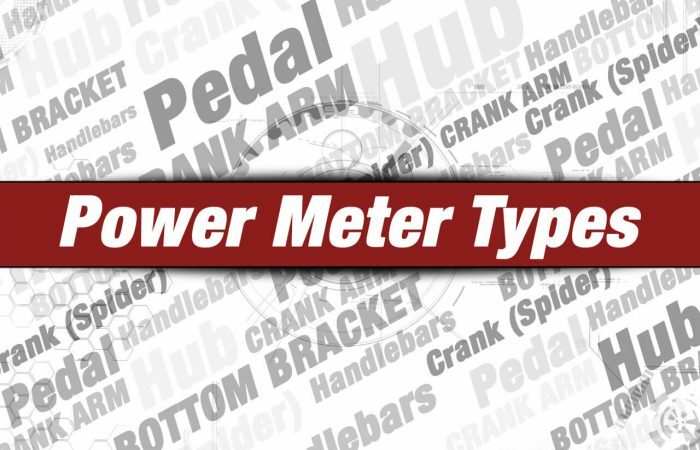 In other words, power meters assume that you turn the pedals at steady speed throughout each pedal stroke revolution. 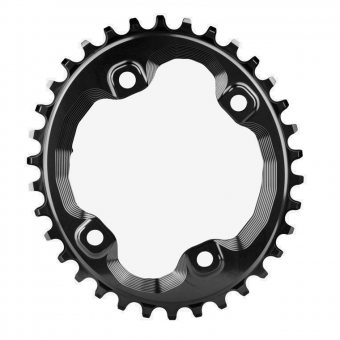 The problem is, oval chainrings cause your crank velocity to change during each pedal stroke, as they limit the time in the dead spot and lengthen the time in the power phase, as discussed above. Indeed, most studies conclude that because of the change in crank velocity, oval rings do influence the accuracy of power meters. More specifically, they cause your power numbers to be inflated. The more non-round your chainring is, the greater the impact on the accuracy of your data. Studies say you can expect an increase in your power of anywhere from 1% to 4%. However, there are those who say this is not the case, rather that power meters and oval chainrings don’t skew or inflate your power data. Take the folks at SRM for example. Both of these arguments seem valid. We’re not engineers and we don’t pretend to have exceptional insight into the inner workings of power meters when used with oval chainrings. We can only go off of what the experts in this field say, and clearly there is a difference of opinion. What we can say is that, while we acknowledge the potential for inflated power numbers, we don’t feel it is a major cause for concern. Why? Because if an oval ring indeed results in higher power numbers, the difference is likely to be slight (unless you’re using highly ovalized rings). In addition, remember that perhaps more important than accuracy, is consistency. 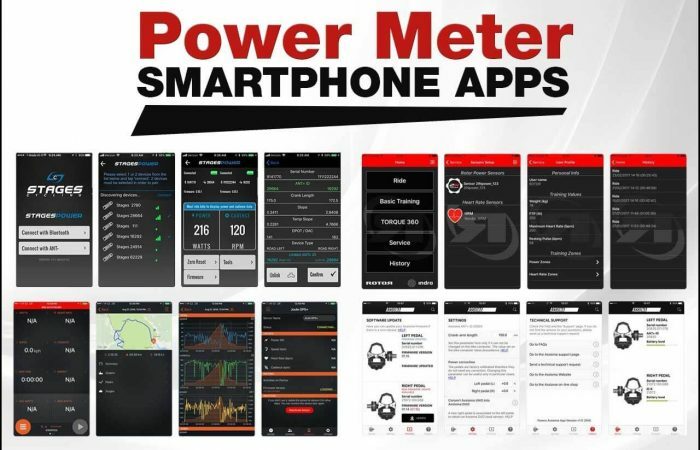 If your power meter gives you consistent power data day-in and day-out, then it’s largely irrelevant if it reads 204 watts when you are actually producing 200. We think that if you are more comfortable with oval rings on your bike, then go for it. Just keep in mind the impact your oval rings might have on your power numbers. The Favero Assioma uses IAV Power Technology (Actual Instantaneous Angular Velocity) to correct for any inconsistencies in pedal speed. IAV allows the Assioma DUO and UNO to measure the true pedaling speed within each pedal stroke. This eliminates the issue of inconsistent pedal stroke revolutions caused by oval rings. Perhaps even better, IAV also improves the accuracy of the Assioma to +/-1.0%. This is just a thorough way of saying they cannot attest to what impact, if any, oval rings might have on accuracy. I would suspect that the impact with Garmin Vector’s wouldn’t be much different than that with any other power meter. In fact, we have a customer that has compared their Vector’s with a Q-Ring to a PowerTap G3 hub. He reports that the difference was negligible. power2max power meters are claimed accurate with oval rings by the manufacturer. Specifically, power2max says the cadence interval on their power meters is not discrete per crank revolution. Rather, the accelerometer data is sampled continuously, just like power data. In other words, they don’t make the assumption that pedaling velocity is constant and therefore, are not impacted by the use of oval rings. The PowerTap P2 power meter perfectly supports non-round rings according to PowerTap. 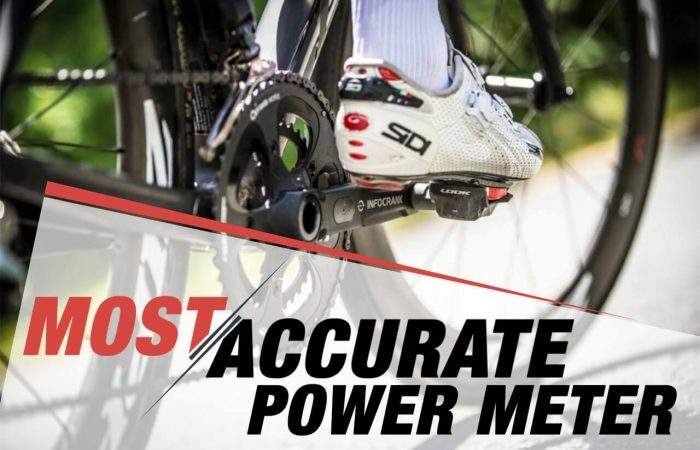 PowerTap says, “The P2s take 40 individual angular velocity measurements and subsequently 40 power measurements per pedal stroke. Any acceleration/deceleration within a pedal stroke would be measured.” In other words, the P2 Pedals account for the fact that your pedaling velocity changes when using an oval ring, and therefore your power data remains precise. Since the PowerTap G3 measures power at the hub, your pedaling velocity is irrelevant. A hub-based power meter doesn’t see or care what type of chainring you’re using. Rather it simply measures the power or torque at the rear wheel. Therefore, the G3 power meter works fine with oval chainrings. There’s no crankset-based power meter more Q-Ring compatible than the ROTOR 2INpower DM Power Meter. 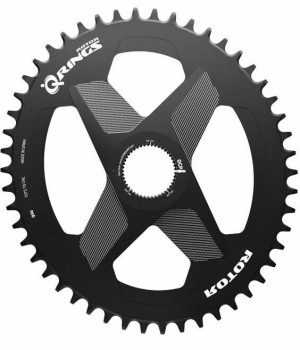 Not only is the ROTOR 2INpower certified accurate with a Q-Ring, but ROTOR power meters feature OCP (Optimal Chainring Position) technology which allows you to adjust your Q-Ring position with a great degree of precision. By fine-tuning the position of your Q-Ring, you can set your pedal stroke to best take advantage of your Q-Rings and get the most power and pedal efficiency out of your crank. Mechanically, the Stages power meter works with oval chainrings. However, they note that their power measurement is “event based, where as an event is one complete pedal revolution”. Like Garmin, due to the angular velocity inherent in oval rings, they note that power will likely be skewed higher. They estimate it can be as much as 4-5% higher. They emphasize that it is indeed fine to use oval rings with a Stages power meter. However the rider simply needs to take this difference into account when using their Stages power meter with an oval chainring.